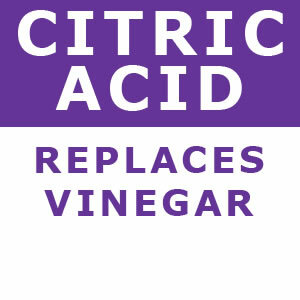 Citric Acid is a more effective cleaning agent than vinegar. Citric Acid provides more hydrogen ions H+ per ml of solution than vinegar. This increased ion concentration provides citric acid solutions with superior retention and removal of carbonate particulate, scale, biofilm, and calcium deposits. 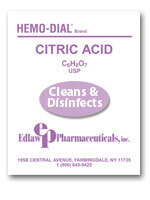 Citric acid from Edlaw provides better results, takes up less space and does not have the "smell" of vinegar. Save Money - CitruClean costs less than $0.10 per rinse...nearly 20% less than vinegar! More Powerful - faster and better at removing carbonate deposits and it won't harm equipment! Save Time - CitruClean batch preparation is fast and easy! Simply pour into mixing / storage container and add RO or DI water. 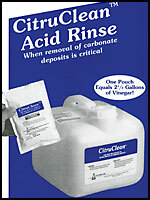 Save Space - one small case of CitruClean pouches will do the cleaning job of 50 gallons of vinegar. Reduce Waste - no disposal of bulky empty bottles! 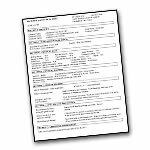 CitruClean Material Safety Data Sheets (MSDS) include information concerning; Generic Product Identity, Hazardous ingredients, Physical data, Physical hazards, Health hazards and spill or leak procedures. 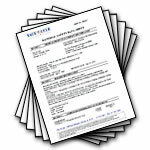 Citric Acid USP Material Safety Data Sheets (MSDS) include information concerning; Chemical Product Identification, Hazards identification, Composition information on ingredients, First aid measures, Firefighting measures, Accidental release measures, Handling and storage, Exposure controls / personal protection, Physical and chemical properties, Stability and reactivity, Toxicological information, Ecological information, Disposal information, Transportation information and Regulatory information.